The Star Trek (2009) sequel will be called Star Trek Into Darkness. "TrekMovie has confirmed with multiple sources that 'Star Trek Into Darkness' has been selected as the title for the 2013 sequel to J.J. Abrams Star Trek movie. This is a title that comes out of a long process of discussion amongst the creative team. As reported earlier, Paramount tested a number of titles for the film over the summer, including at least one title that did not include 'Star Trek.' Also noted in our earlier article, the title (by design) does not include a colon, like were used for the Next Generation films such as "Star Trek: First Contact" or "Star Trek: Nemesis." 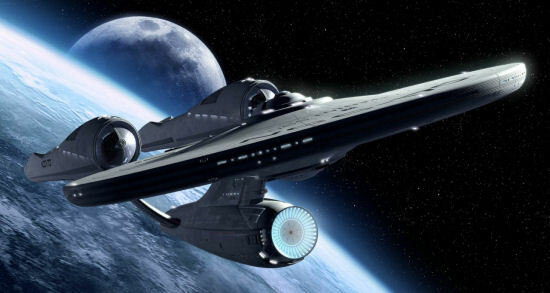 Although the title hasn't been officially confirmed, the domain names www.startrekintodarkness.com and www.startrekintodarknessmovie were both registered Friday through MarkMonitor, an anonymous domain registry service that has been used by Paramount Pictures for other official movie sites. The Star Trek 2 title doesn't give much away about the plot, but it may reference the darkness of space or a darker plot. It may also be a reference to the "five-year mission" of the original Star Trek Enterprise to "explore strange new worlds" and seek out "new life and new civilizations." Filming is now complete and it's in post-production. The cast has started talking about what Star Trek 2 will be like. "It was bigger. It was bolder, I think, than the first one, and that was pretty big and bold from my stand point," Zachary Quinto (Spock) told The Wrap recently. Chris Pine (Captain James T. Kirk) told Total Film, "Like the first one, there's some serious issues being dealt with. And I'd say the threat is even greater in this one. The force [the Enterprise crew] are met with is much more frightening. It's relentlessly action-packed and in terms of character development it goes places you'd never expect." Star Trek Into Darkness will be directed by J.J. Abrams and star Chris Pine, Zachary Quinto, Zoe Saldana, Karl Urban, John Cho, Bruce Greenwood, Simon Pegg, Anton Yelchin, Benedict Cumberbatch, Alice Eve and Peter Weller with a screenplay by Alex Kurtzman, Roberto Orci, Damon Lindelof. It's scheduled to be released in theaters on May 17, 2013 in 2D, 3-D theaters and IMAX 3-D versions. What do you think of the title? What do you feel it means? 'Star Trek' Sings "Call Me Maybe"
Who Is Star Trek's Gary Mitchell? Works as a title. Smart of them to snag the domains! It seems kind of lame but at least it's not as confusing as calling it Star Trek 2 would have been. Star Trek Nemesis did not have a colon, either. I'm not sure. But I don't think it's a bad title, at any rate. Awesome title for sure, Maurice! I reckon it means someone mean and sinister from for eg. star treks 'Mirror, Mirror, Empire' is going to wreak havoc on the friendly Federation/USS Enterprise. I'm tired of sequel titles that go by the Roman numeral + subtitle formula (the first five Trek sequels) and sequel titles that sound like Battleship grid locations (T2, X2), so Star Trek Into Darkness is a nice break from the norm, even though as someone pointed out on Twitter, they're in space, so aren't they always trekking into darkness?